Addison Webster Preston was born in the town of Burke, Vt., but removed in early childhood with his parents to Danville, which was thenceforward his home. 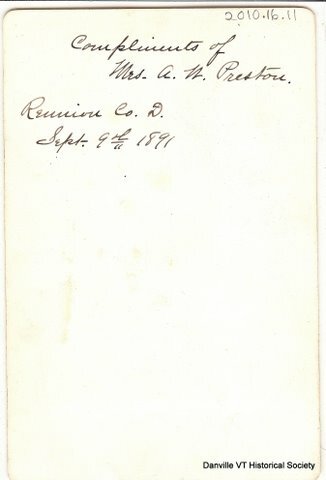 He fitted for college, entered Brown University at the age of 21, and took high rank as a scholar; but after a years and a half, was obliged to leave college by the condition of his health, and as his physician advised a sea voyage, he sailed to Australia, where after a stay full of adventure, he sailed for California, where he spent several years. He had returned to Danville and was engaged in business there when the war broke out. 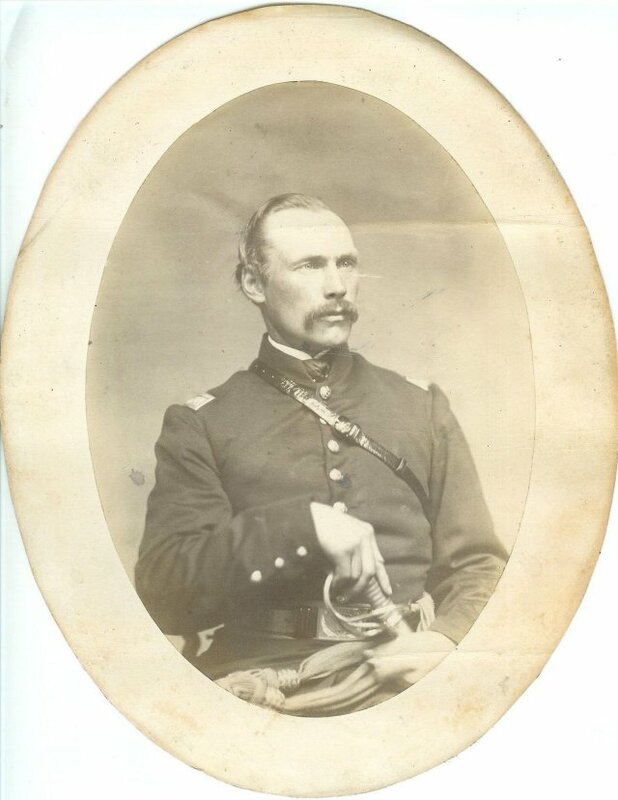 He enlisted in September, 1861, in the First Vermont Cavalry, was chosen captain of company D, which he had been active in recruiting, and from that day gave all his energy of mined and body to the duties of a soldier. He had had the command of the regiment for much of the time during the twenty months preceding his death. He was one of the best disciplinarians that ever commanded the regiment. He took good care of his men and was popular with them. As a man he was frank, hearty, genial, quick of thought and action. As a fighter he was brave to a fault, impetuous, eager to strike, ready to go himself wherever he sent his men, and unwilling to leave any place of danger as long as there was anything to be done. He was twice wounded, at Hagerstown in the Gettysburg campaign and at Culpeper Court House two months later. His commission as colonel was delayed in transit by the exigencies of the campaign and reached the headquarters of the regiment the day after his death. Had he lived a few days longer he would have been promoted to a brigadier generalship; for he stood very high with his superiors, and they were only waiting for his appointment as colonel, to give him high rank and more responsible duties. 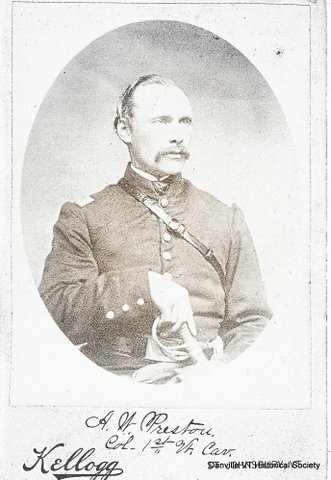 General Custer voiced the opinion of many, when, as he turned away from his corpse, he said: "There lies the best fighting colonel in the Cavalry Corps." 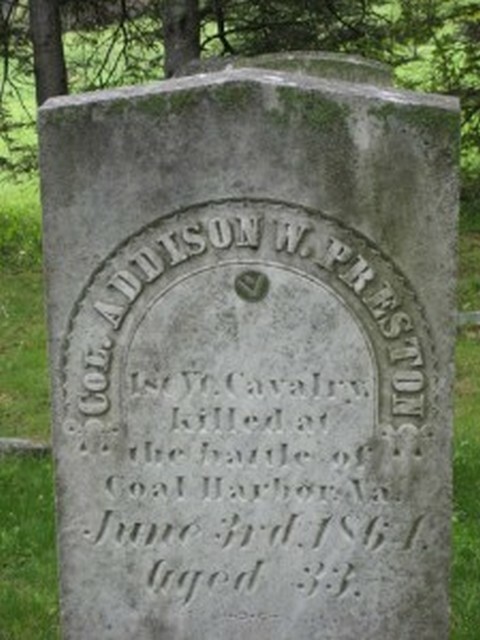 Colonel Preston's remains were taken to White House and thence to Vermont, where his funeral took place at Danville, with extraordinary demonstrations of honor and respect on the part of his townsmen and of the citizens of the surrounding towns and of a large portion of Caledonia county. He left a widow, an estimable lady, whose maiden name was Juliette Hall, of Lowell, Mass., and two children. Source: George Grenville Benedict, Vermont in the Civil War, (Free Press Association, Burlington, 1888), 645. 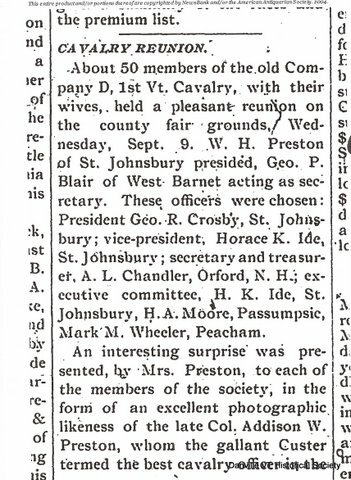 In 1891, at a GAR meeting in St. Johnsbury, Preston's widow presented the members of Company D, Preston's original company, with copies of the above photograph as a momento. The event was documented by an article in the Caledonian Record. 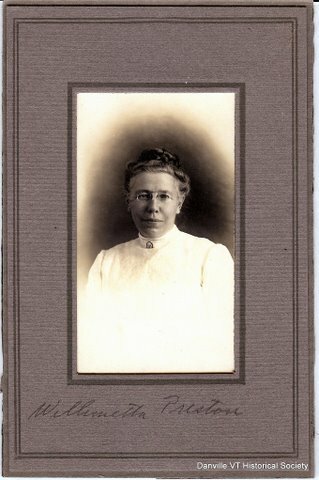 The Danville Historical Society has also graciously given us a photograph of one of Preston's children, Willametta.